It’s getting warm again, time to put away that oatmeal and bring out the cereal! Here’s how to sneak peanut butter into a common breakfast item. Sometimes the simplest idea is the best. This is one of those ideas. A reader suggested this idea saying that she and her brother decided to add peanut butter to their cereal one day when they were young. 20 years later she refuses to eat it any other way and if she pours a bowl of cereal and milk only to discover that she is out of peanut butter, she gives the cereal to her dog. I investigated this proposition and have reached a conclusion: this is the new way to eat cereal. The peanut butter will enhance any cereal giving you a sweet, salty and crunchy morning treat. 1. Place cereal in bowl, pour milk on top. Drop ball of peanut butter in the center. Dig at the peanut butter to get a little bit with each bite. Never look at cereal the same way again. Really? I’ll try it with oat porridge tonight… maybe it’ll melt nicely and evenly! With hot cereal it will melt and mix nicely throughout. Should be delicious! ha!i JUST finished a bowl of peanut butter and cereal.Oh,and it was Nature’s Path Peanut Butter Granola,too. I agree-this is the only way i’ll eat cereal.I just chopped up half a pear,a banana,some medjool dates,poured some pb granola and almond milk ontop and dolloped 2 big scoops of crunchy peanut butter.taking a big spoonful and smearing the pb around the rim on the bowl in ambrosial.and then,when yr done,drinking the sweet peanut butter-y milk…so good.i can’t believe you’ve never done this! I love adding PB to my cereal! I haven’t eaten cereal that way, but that’s how I eat oatmeal. I prefer to warm up the oatmeal and then mix the PB into it. That way I don’t have specifically pick at the PB with each spoonful…it’s perfectly mixed into every bite. Ah, yes. I have never made a bowl of oatmeal without it, it mixes in nicely. But there is something…magical…about picking at the glob of peanut butter with each bite. After always eating my oatmeal with PB all winter, I started doing it with cereal too. Any cereal, hot or cold, is always better with peanut butter! This is how I eat my cereal, except without milk and with a sliced banana. Stirring in some Greek yogurt is fabulous, too! Hey. I just tried it: oat porridge with peanutbutter. Its awesome. It melts right into it. Nutty at every bite. Mmmmmmm! I actually mix All-Bran, crumbled up really small, with peanut butter and some Splenda, and a bit of milk, it makes for a weird texture and an unnappealing colour, but the flavour is amazing! Hey, it’s not like I’m entretaining with it! I can imagine it not looking so hot but it sounds great! This looks like something I could get into. Thanks for sharing! Ha ha – so glad you tried this Nick. I love peanut butter in my cold cereal! This morning I had oatmeal (hot) with peanut butter mixed in. If you haven’t tried it, you must. I’m actually not a cold cereal person. The above recipe is what I usually have for snack. I have hot oatmeal with peanut butter every single morning. Well I enjoy peanut butter in every which way but I can see not wanting it in every bite of oatmeal. Try it in the cold cereal. Since you have to dig at it with each bite the flavor is a separate part of the bite and not wholly encompassed, if that makes any sense. hmm, haven’t tried this one!! I totally do this on a daily basis. I use all sorts of nut butters – almond, cashew, peanut. They are all amazing. This morning it was Kashi H2H with almond milk and a heaping spoonful of PBl… delish! What a fabulous and yummy idea! 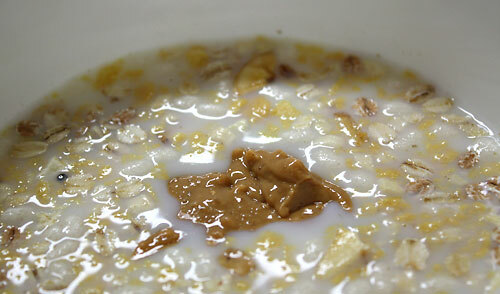 Had oats a while ago, wonder how it would have tasted with a dollop of PB. I was at a restaurant which served tofu with peanut butter in the form of a gravy. I wasn’t too fond of the idea, but my friend who had the dish said it was great. I regret not trying it. Have you tried the combination before? I do this with yogurt and cereal or granola and it’s awesome!!!! I will havee to try with milk soon. wow…I love my cereal and I love PB but not both together…I must try this! Haha, no joking, all deliciousness. It’s tastier than I could have imagined. I have never heard of this before or even thought of doing it. Your definitely on to something. This is genius! Nick, this looks great. It would be a great boost to the cereal. I’ve never tried it with cold cereal, but I LOVE it with my daily oatmeal! I love PB in my oatmeal; why wouldn’t I love it in my cold cereal? This sounds totally delicious! I’m all about simple and delicious. Sorry that I’ve been an absent commenter; I just finished up my law school exams and am finally getting around to my google reader. Congrats and welcome back. This breakfast is the perfect reward for a job well done! Such a simple innovation – but such a facinating one. I bet this would be great with my rice chex! Look forward to trying it out! I saw the picture on FoodPhotoBlog this morning and my first thought was, EEWWWW! Then I had a second thought, “maybe it wouldn’t be so bad” so I tried it with oatmeal this morning. WOW. Really a great change of taste. Will try it again tomorrow with cold cereal. I could eat peanut butter right out of the jar. Thanks for the great suggestion. I my family thought I was weird for doing this! lol little do they know. I only eat cereal with peanut butter. I don’t actually put in the the cereal itself. I scoop up the cereal with a peanut butter covered spoon so as to get it with every bite. Delicious. I have to agree with the post above- I bet this would be great in oatmeal, I’ll definitely give it a shot. Can’t believe you’ve never had peanut butter in oatmeal before! I have had oatmeal every day for the past 4-5 years and not once have I forgotten to add peanut butter! My father introduced this to my sister in the early 1940’s as he passed away, in 1950 before his other children started eating cold cereal, she passed this on to all her siblings who have passed the habit on to all of their children and so on. That’s amazing. It’s just one of those traditions that was either passed on to you or it wasn’t. It seems to be a lost art nowadays which is too bad! Forgot to mention, with the later advent of commercial peanut butter flavored cereals. and granola bars I am surprised more people haven’t tried it. By the way, PB & maple syrup are a great taste combo with or without the pancakes. And that’s a good point too, it’s still not an obvious idea/recipe unless it was passed down to you! For kicks I decided to try this out tonight because my love for both cereal and peanut butter runs deep. Oh. my. amazing. I can’t believe I hadn’t tried it before now! I have a feeling I’m going to be eating this a lot more often. Haha, this is my go-to dinner when I have nothing else planned or I need a light meal. It’s not just a meal, but a satisfying experience as well! So glad you enjoyed it. Haha, I never thought of that. But yes, the exquisite taste defeats the nasty image. this is the ONLY way I’ll eat my cereal. It was a discovery that changed my life 4 years ago on a camping trip, where peanut butter is naturally mixed with everything, and we happened to have cereal and powdered milk as well. mmmm! Correct me if I’m wrong, but it sounds like you had an incredible eye-opening discovery on this camping trip. It quite possibly could have been the best camping trip ever! It’s been a long time since I had an epiphany….perhaps I should go camping…. I’ve tried peanut butter in cereal and actually disliked it because the peanut butter taste didn’t last long enough in my mouth. The milk melts it away. I’ve also tried it in oatmeal and rather thought that the oats made the PB taste drab. But looking at all these comments, I wonder, am I doing something wrong? Hmm…what kind of peanut butter did you use? I would suggest a peanut butter with no sugar. Try a natural chunky peanut butter that has a thick consistency and has salt in it so you get that salty/sweet contrast! Also, try using more peanut butter! As for oatmeal….it doesn’t add too much unless you add other things along with it. For example: Peanut Butter & Jelly Oatmeal or Pumpkin Pie Oatmeal. At the very least, slice half of a ripe banana (with some brown spots) into the oats/milk before you cook it – the banana will cook down and basically dissolve and will help bring out the peanut butter flavor. Also, a dash of cinnamon helps. Let me know how it works out for you! Haha, that’s an interesting idea. So you want to make cereal bars of some sort? What I would suggest is mashing the chex into small chunks and then mixing them into microwaved peanut butter. The small pieces and powder from the chex would help hold the peanut butter together – sorta like the inside of a Reese’s but without the sugar (though you may want to add some). Then, putting it in the fridge afterward would help it set. Sounds interesting – I just may try that! Thanks Dee! We sound like we should be brother and sister =). Feel free to share any recipes with me, I’m always up for learning more about peanut butter! I got the idea to put peanut butter in my cereal from my mom lol. My favorite cereals to mix peanut butter with are chocolatey ones. I am actually eating a bowl of cocoa pebbles with peanut butter right now. Let’s be honest, it’s totally not healthy so I eat it more as a snack. It reminds me of a cereal bar without the marshmallows. Good stuff. It IS amazing! Thankfully I can fit a few jars of PB in my luggage! Completely love peanut butter in my Cheerios, Kix or other apt cereal. The wife is not a huge fan, but it’s awesome. GOod work.